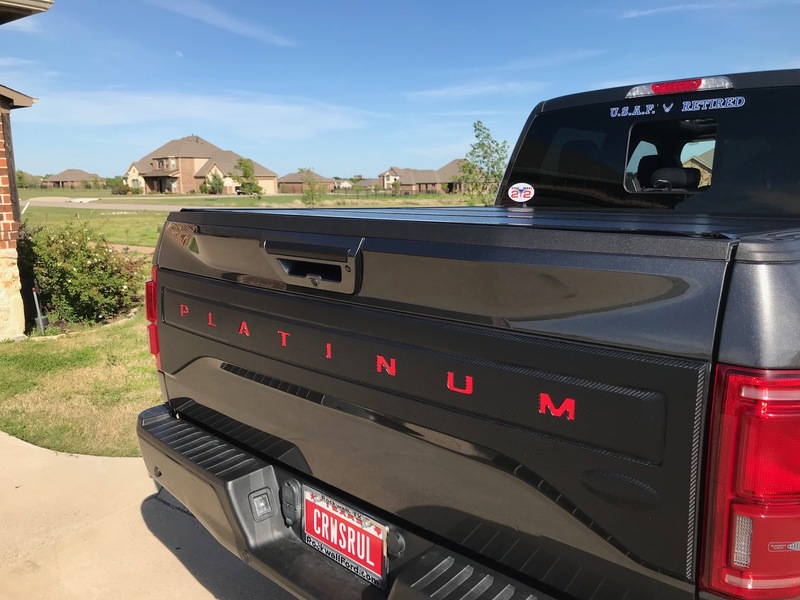 I've looked all over the place to find a suitable replacement of the tailgate chrome trim on my 2016 F150 Ecoboost Platinum. Today I wrapped it with Dark Carbon Fiber Vinyl made by VViVid. Insert letters are made by BDTrims. snakebitten, Elmore328, AGPank and 4 others like this. 2016 3.5L Ecoboost, Platinum Screw, FX4. Max Tow, BacFlip. 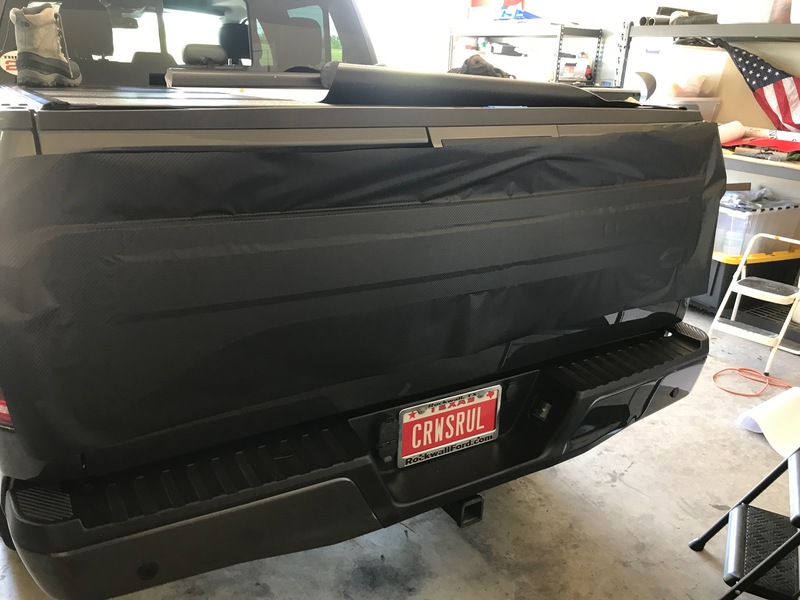 I'm guessing you won't be offended if I say I like that WAY better than the huge contrasting cover Ford uses for some of the King Ranch, Platinum, and Limited trucks. That actually looks great with the color of your truck. 1992 Mustang 5.0 coupe bolt-on play thing. Sometimes, a fool should trust what the wise say, instead of coming out yelling Totally Not True... because you couldn't find it on google. The wise usually know what they are talking about, because of either hands on experience, or maybe they've just been around long enough to know what's what. 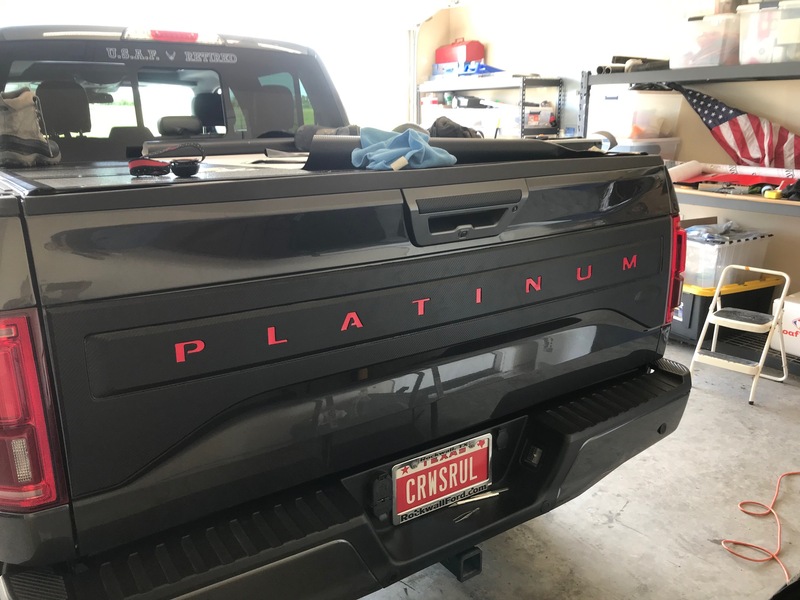 Looks great- I'm not a fan of the big silver panel on the KR, LTD, Platinum. I've done some vinyl wrapping on my B/C pillars, but that was due to discoloration. Also did some carbon fiber on my interior door panels. The stuff they have available now is pretty easy to work with. Good job! Definitely a improvement, looks great. DOesn't look too bad actually. The Ford needs to be shown tough. I don't like that big thing, except on white, it looks ok then for some reason. Raptor has a similar thing. I know a guy bought a brand new one and made them put a "regular" tail gate on it before leaving lol. My New Custom Hydrodipped Dash! - Sweet Carbon fiber!